Chiapas is Mexico's southernmost state and although it is one of the poorest states, it offers great biodiversity and remarkable landscapes as well as interesting cultural expression. In Chiapas, you will find lovely colonial towns, important archaeological sites, scenic beaches, tropical rainforest, lakes and high mountains, an active volcano, as well as a large Maya indigenous population. Topography: volcanic mountain ranges, tropical rainforest, and coastal lowlands. The highest elevation is Tacaná volcano at 13 484 feet above sea level (4 110 m) in the Sierra Madre de Chiapas. The capital of Chiapas state, Tuxtla Gutierrez has a population of approximately half a million inhabitants. It is a busy modern city with a reputable zoo and an excellent archaeological museum. Close by, the Cañon del Sumidero (Sumidero Canyon) is a must-see. This is a 25 mile-long river canyon with cliffs over 3000 feet in height and abundant wildlife, that can best be explored on a two and a half hour boat trip from Chiapa de Corzo or Embarcadero Cahuare. One of Chiapas' most charming cities, San Cristobal, was founded in 1528. A colonial city with narrow streets and colorful one-story houses with tiled roofs that enclose lovely courtyards, San Cristobal offers the visitor not only a journey back in time with its many churches and museums but also a contemporary bohemian ambiance of art galleries, bars and sophisticated restaurants catering to an international crowd of travelers and expats. Colorfully dressed indigenous people from the surrounding villages sell handicrafts in the market and streets, rounding out the city's very lively atmosphere. Read more about San Cristobal de las Casas and the best day trips from San Cristobal. 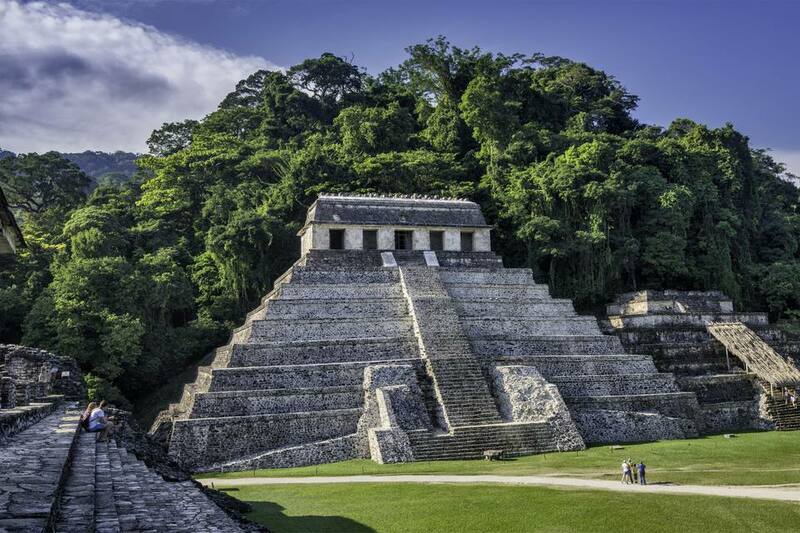 The small town of Palenque is the bustling hub for excursions to one of the most important and beautiful prehispanic sites in Mesoamerica, surrounded by rainforest, and originally called La Kam Ha (the place of much water) before the Spanish renamed it Palenque. The on-site museum is a recommended stop for information about the site and Maya culture at the end of the ruins visit (closed Mondays). On the way to Palenque from San Cristobal de las Casas, don’t miss a visit to the stunning waterfalls of Misol-Ha and Agua Azul. For those who would like to immerse themselves more in the history of Mesoamerica, there are more amazing archaeological sites in Chiapas that can be visited from Palenque: Toniná and Bonampak with its unique wall paintings as well as Yaxchilán, right on the banks of the Rio Usumacinta, Mexico's largest river. The latter two are situated in the middle of the Selva Lacandona that forms part of the Montes Azules Biosphere Reserve. Heading to the southwest of the state, you can follow the Ruta del Café (coffee route), hike Tacaná Volcano or simply head off for some leisure to the Pacific coast with its mostly grey-black beaches at Puerto Arista, Boca del Cielo, Riberas de la Costa Azul or Barra de Zacapulco. Also in Chiapas: Sima de las Cotorras - thousands of green parakeets make their home in this huge sinkhole. The Zapatista (EZLN) uprising took place in Chiapas in the 1990s. This indigenous peasant revolt was launched on January 1, 1993, when NAFTA came into effect. Although the EZLN is still active and maintains a few strongholds in Chiapas, things are relatively peaceful and there is no threat to tourists. Travelers are advised to respect any roadblocks they may come across in rural areas. There are international airports in Tuxtla Gutierrez (TGZ) and Tapachula, on the border with Guatemala.